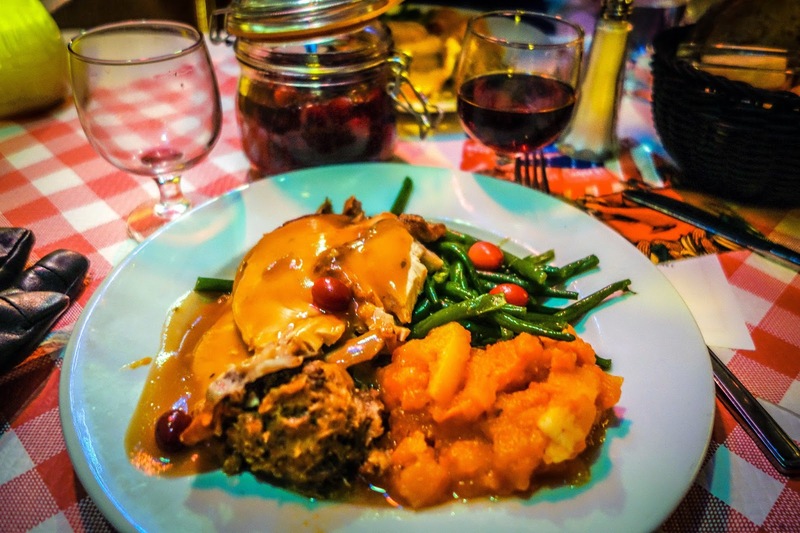 My Parisian Island: American Thanksgiving in Paris! As the Thanksgiving weekend comes to an end, we start the week with thankful hearts and swollen bellies. Something I am certainly thankful for is being able to recreate some semblance of this cherished American tradition 5,000 miles away from the land of the free. Because it is so easy to eat out at one of the hundreds of heavenly restaurants, bistros and brasseries that litter Paris (and the amazing shopping), I fear closet space has trumped oven space, which makes it a bit difficult to cook a turkey. Although, if one is fortunate enough to have an oven in Paris there are many places to purchase an award winning bird like the Thanksgiving's (American Grocery) store located in the Marais. Situated in Paris' Marais since 1990, Thanksgiving's shelves overflow with the most complete selection of American products in France, from traditional to trendy. There you can find more than a turkey including all the ingredients you need to make a proper Thanksgiving meal (the Real McCoy in the 7th arrondissement or the Epicerie Anglaise in the 10th also offer a wide arrange of American products). 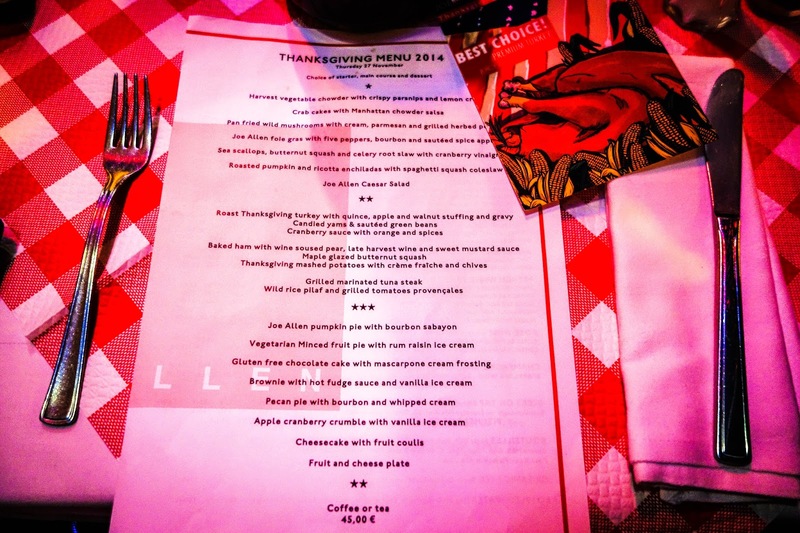 Although there are a quite a few options of restaurants that offer a Thanksgiving dinner (Ô Chateau, Verjus, Blues Bar-B-Q, Le Saint-Martin Bistro, and Ralph’s) I chose for something super traditional, tried and tested as well as cheap and cheerful…Joe Allen’s. Joe Allen, America's oldest brewery in Paris, opened January 20, 1972. Since then, it has been the home to many US Parisians or Parisians who love American culture (and food). 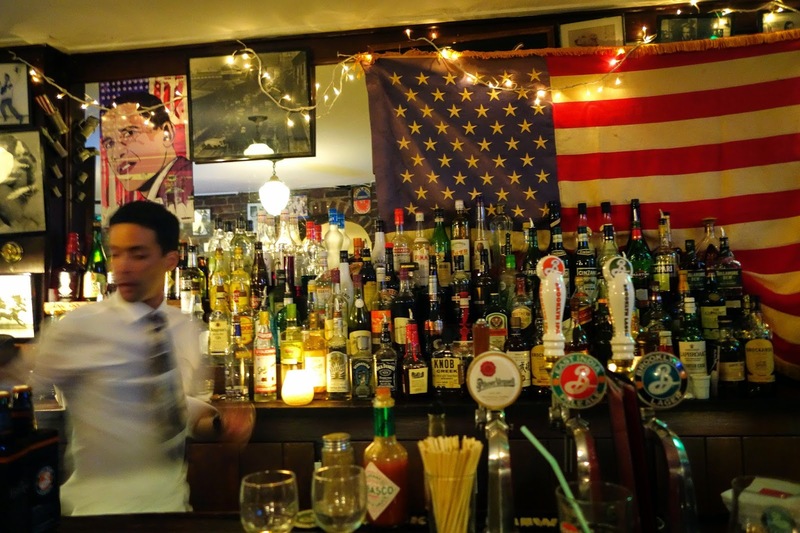 The restaurant offers an eclectic cuisine typical of a New York brewery today, and a selection of world wines and cocktails. 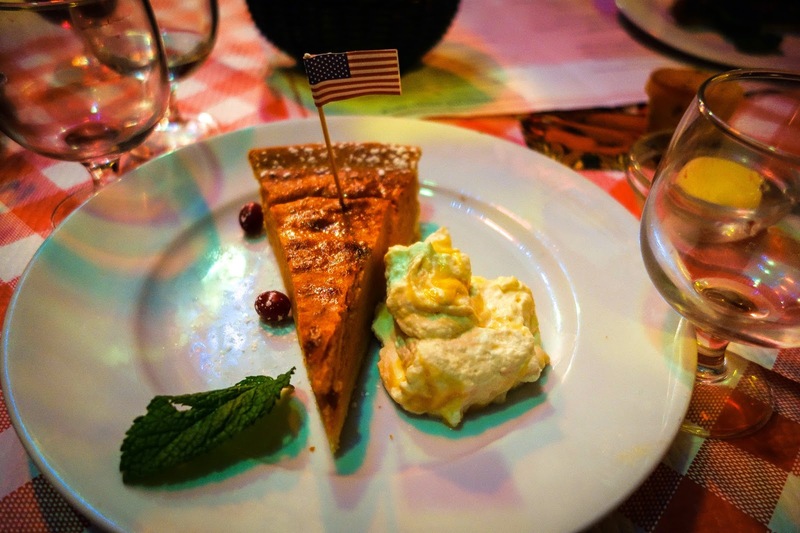 For thanksgiving they offer a pretty authentic menu at 45 Euros per plate where you can choose your entrée, main and desert from several different American thanksgiving dishes. I went for the roast Thanksgiving turkey with quince, apple and walnut stuffing, gravy, candied yams & sautéed green beans for my main. On the table there was an unlimited supply of cranberry sauce with orange that went well with all. And for desert I went for the Joe Allen pumpkin pie with bourbon sabayon (all paired with French wine of course ;) The atmosphere was extremely festive and boisterous. Although I felt completely satisfied with my bonafide American and yummy Thanksgiving feast, I realised that it wasn’t so much the food that made the meal special, but the amazing friends and family to share it with.